The Kingdom of Saudi Arabia’s current approach to anti-corruption was initially launched in 2007 with the initiation of its National Strategy for Maintaining Integrity and Combating Corruption (‘National Strategy’), which brings together principles of Shari’a, domestic and international law. The National Strategy determined that, as corruption issues have grown more complex over time, comprehensive reform programmes should be launched to ensure that the Kingdom’s defences are efficient at identifying the problem and suggesting solutions, whilst also ensuring that Saudi Arabia meets its obligations under international anti-corruption conventions. Efforts to eradicate corruption have been undertaken in recognition of the fact that corrupt practices are not isolated by nature but are, in fact, direct causes of other widespread social, economic and national security problems. The cost of unlawful practices is reflected at every level of society, and has the potential to severely damage the prosperity of the country if they are not adequately addressed with measures to combat institutional corruption. On establishment of the National Anti-Corruption Commission in 2011, Nazaha (as it is more commonly known) became the first regulatory body in the Kingdom to monitor the implementation of the National Strategy. Nazaha exercises its jurisdiction over the public sector and all companies that are owned 25 percent or more by the state, and is fully independent in that it reports directly to the King and is not answerable to any other state institutions and no other state bodies have the authority to interfere in its work. Although the Commission is only eight years old as an institution, it has already benefited from efforts to modernise its operations, in respect of both legislative changes and technological advancements. In November 2017, in a bold step towards eliminating corruption, His Excellency King Salman bin Abdulaziz Al Saud declared the establishment of the Supreme Committee against corruption comprising leaders from relevant government ministries to support the work of Nazaha and add an additional level of authority in order to prosecute corruption offences at the highest echelons of government. The Supreme Committee was established to supplement the efforts of Nazaha rather than supersede it, and the two organisations continue to work in unison to protect the integrity of Saudi Arabia’s market. From a technology perspective, in order to increase the effectiveness of its supervisory capacity, Nazaha has also started using electronic surveillance technology, which acts as a direct technological link between the Commission and other agencies and increases Nazaha’s ability to monitor processes and activities. For example, this link enables Nazaha greater access to check projects or programmes that fall under the Government Tender and Procurement Law (Royal Decree No. M/58 of 27/09/2006). Public procurement is universally considered to be a particularly potent area of risk for corruption, so Nazaha’s increased oversight of public activity in this arena has the potential to detect and prevent a considerable quota of illicit activity. In addition, Saudi Arabian authorities released a draft version of an updated Government Tender and Procurement Law for public comment in 2017 which contained extensive amendments to the public procurement process. 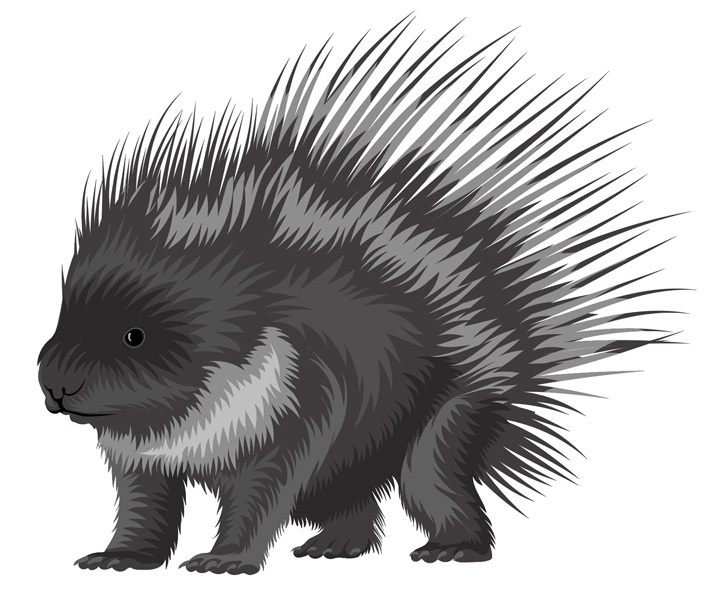 Whilst the deadline for comments has long since closed, there has as yet been no update as to when the new law is expected to be implemented. Aligned with the National Strategy, Nazaha is more than a symbolic addition to the Government’s integrity framework, and plays a critical role in implementing a full range of initiatives designed to combat corruption across both the public and the private sectors. From a public sector perspective, Nazaha is responsible for ensuring that all of the government institutions that fall under its jurisdiction adopt effective internal policies and programmes to prevent corrupt activity. Beyond the confines of public service however, and in line with the second chapter of the National Strategy, Nazaha also aims to cultivate the appropriate environment for successful development, particularly in social and economic spheres. By creating a culture of integrity, Nazaha is fostering a zero-tolerance approach to corrupt practices across society. Societal outreach is a pivotal part of Nazaha’s activity due to its role as the designated authority to receive and investigate reports of corrupt behaviour, which forms a substantial part of its oversight responsibilities. The reporting process is therefore a fundamental mechanism for Nazaha’s operations. Accordingly, Nazaha has established capacity to receive reports in a variety of ways including via hot lines, fax, email, website and even telegraph. As a further aspect of its modernisation, Nazaha also recently launched a smart phone application which operates as an additional platform for reporting, and has emerged as one of the most efficient and engaging methods of connecting with the general population, constituting almost 30 percent of all reports received in 2018. Rather than operating singularly as a means for receiving reports, the App also has a secondary function to survey perceptions of integrity amongst public and private sectors. For expediency, the submission platform on the App also supports media attachments such as pictures, documents or video files that can be used as evidence for the report, enhancing the initial review of the report for Nazaha officials. After receiving a report, an initial assessment is conducted by a Nazaha specialist who would be designated according to the subject of the case. For example, in the case of a construction project that has not been executed in a proper manner, the assessment will be held by either a legal background expert, an accountant or an engineering expert, subject to the alleged type of infraction. A second review will then be undertaken by a higher-level committee conducted by an appropriate expert. The committee would decide whether the case should proceed or alternatively, in cases where the matter is beyond Nazaha’s jurisdiction, should be saved and referred to another competent authority. In such instances, the reporter will be notified and Nazaha will follow up with the relevant authority until the issue has been resolved. If the reported incident is within Nazaha’s jurisdiction and the recommendation is to proceed, the Commission will appoint one of its experts to gather the available evidence, including witness statements, and will subsequently refer the case to the Public Prosecution. 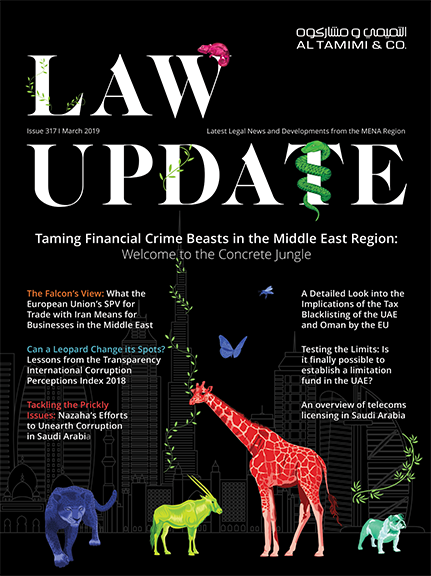 As part of Saudi Arabia’s significant anti-corruption reform over recent months, dedicated specialised anti-corruption units have been set up within the public prosecution, which were established with an emphasis on investigative and judicial powers to address corruption instances with the necessary urgency. Due to the importance of investigative effectiveness in such cases, Nazaha’ has also been empowered by several Royal Decrees (No. 4795 of 22/12/2012, No. 37993 of 04/07/2012 and No. 25686 dated 15/04/2012) to enhance the Commission’s investigative capacity in all governmental tenders and procurements, ensuring that the services provided to the public are implemented according to proper standards of public service. A specific department in the Commission is dedicated solely to overseeing mega projects which are viewed as instrumental to the development of the country. 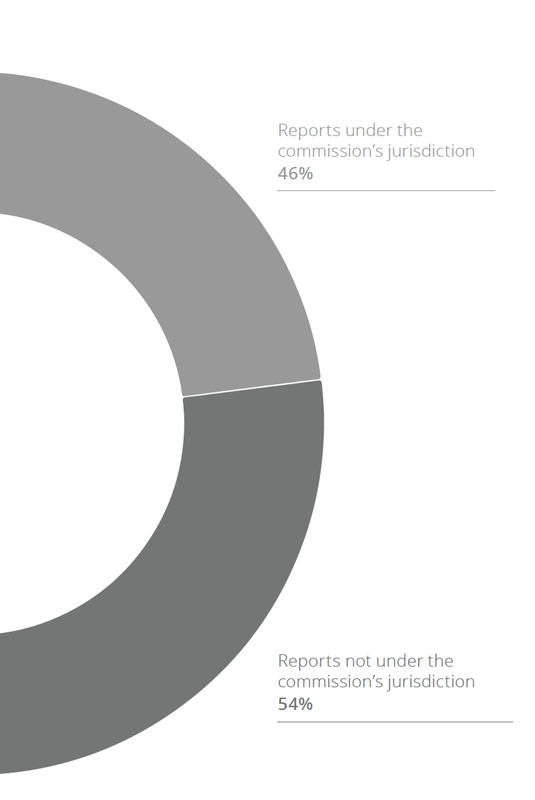 This is a discretionary and holistic process, whereby the commission selects a project to survey from its outset, looking for breaches in procedural protocol that may indicate improper practices. 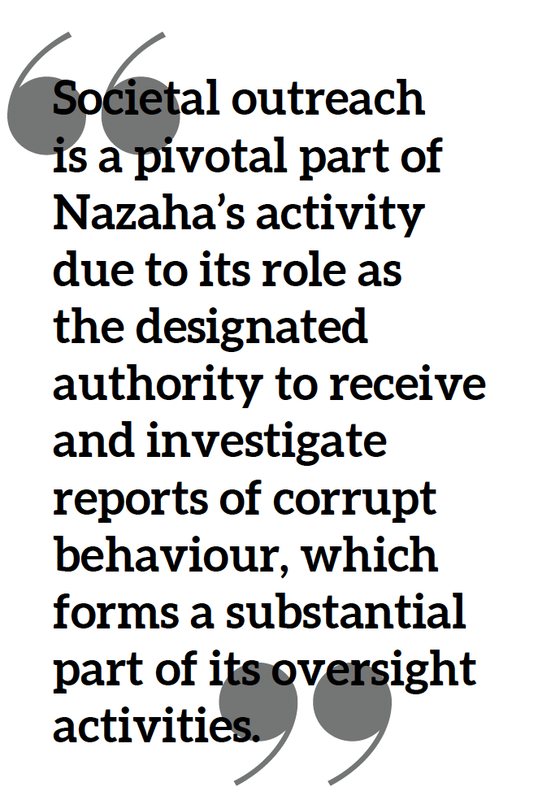 Finally, as an original part of its mandate, Nazaha offers protection to whistleblowers by assuring the confidentiality of their identity and, if the whistleblower’s identity is discovered, Nazaha will honour the reporter’s efforts to combat corruption by providing its protection against retaliatory action. Additionally, in order to encourage societal vigilance against corruption, Article 13 of Nazaha’s statute authorises the provision of moral and financial incentives for whistleblowers. Accordingly, Article 17 of the Anti-Bribery Law (Royal Decree No. M/36 of 30/06/1996) authorises rewards for whistleblowers under certain circumstances of at least SAR 5,000 and up to half of the total money confiscated in punishment of the reported crime. Higher amounts may even be rewarded in exceptional cases where it is deemed appropriate. Whistleblower protection is a relatively underdeveloped legal concept in the Middle East compared to other international jurisdictions, but Saudi Arabia has recently taken promising steps to enhance its existing reporter protection. Via Royal Decree No. 41043, issued in May 2018, full protective measures are now applied to anyone that reports corrupt activities, including a prohibition against employers taking punitive action against employees who have exposed illicit internal practices. These measures, though significant, are only a prelude to the impending full issuance of a law of protection of witnesses and victims of corruption, which is expected to be implemented in the imminent future following Nazaha’s announcement of its completion at the end of February 2019. Nazaha has played a prominent role in the Kingdom of Saudi Arabia’s anti-corruption efforts since its establishment in 2011, and its preeminent position is increasing in line with greater public engagement in corruption issues; in 2018, Nazaha reported a 50 percent increase in the number of reports of suspicious behaviour received compared to 2017. Even as the Kingdom implements additional measures to take a more pro-active stance against corruption in the public sector, Nazaha’s role as the primary point of contact between the public and private sectors for corruption concerns ensures that it remains the touchstone for public sector integrity. Consequently, its reporting mechanism and procedures are of fundamental importance. Efforts to enhance Nazaha’s internal capacities, such as increasing its utilisation of technology and establishing methods of cooperation with specialised investigation units, play a broader role in the overall anti-corruption efforts and may prove to be a well-placed barb in the side of corrupt actors in the Kingdom.